The Enfield Green Party issued the following statement on 28 January 2019. 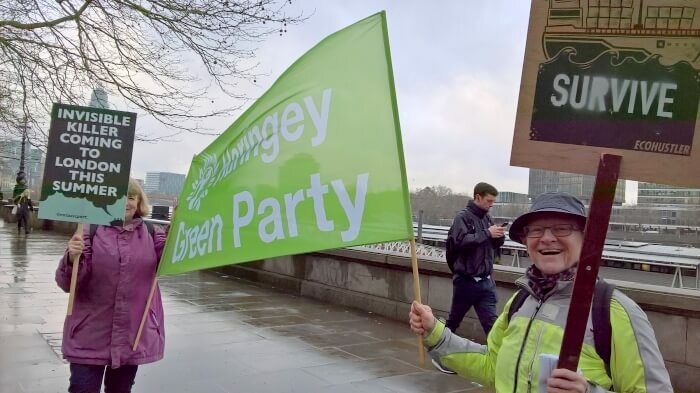 The Enfield Green Party welcomes the Mayor of London’s declaration of a climate emergency, which was made in response to a motion by the London Assembly submitted by Green Assembly Member Caroline Russell. Concern about climate change is far from new and should have resulted in greenhouse gas emissions falling. In fact emissions rose by nearly 3% last year and this fact alone justifies calling the situation an emergency. The strong consensus of climate scientists and economists – backed by a majority of the public – is that urgent action is required by individuals and by all levels of government. We are pleased to see that a motion calling on Enfield Council to declare a Climate Emergency is on the agenda for its next meeting. We urge all councillors to ensure that the motion is debated and approved and to instruct council officers to identify ways to reduce emissions in the borough of Enfield. According to official figures Enfield residents created, on average, CO2 emissions of 3.4 tons per person in 2016. Of that 1.3 tons came from our houses and another 1.3 from travel and transport. Written on 09 December 2018 . On Thursday 6th December the London Assembly passed a motion calling on the Mayor of London to declare a climate emergency in London and put an emergency plan in place. “Catastrophic climate breakdown might be as little as twelve years away – this would have profound impacts on every aspect of our lives in London from flooding and overheating in summers, disruption in our food supply chains as well as in the wider natural world. This Assembly notes that the IPCC’s Special Report on Global Warming of 1.5°C, published in October 2018, describes the enormous harm that a 2°C rise is likely to cause compared with a 1.5°C rise, and confirms that limiting Global Warming to 1.5°C may still be possible with ambitious action from national and sub-national authorities and others. This Assembly notes the Mayor’s climate change mitigation and adaptation responsibilities and recognises that he aims to make London a zero-carbon city by 2050 and would welcome further ambitious steps. We welcome action by Bristol city council and other city councils around the world to declare and commit resources to tackling a ‘Climate Emergency’. We urge the Mayor to declare a Climate Emergency, supported by specific emergency plans with the actions needed to make London carbon neutral by 2030, call on government to give him the powers and funding to make this possible and, as vice chair of the C40 Cities network, to be a leader on this agenda. Written on 07 August 2018 . 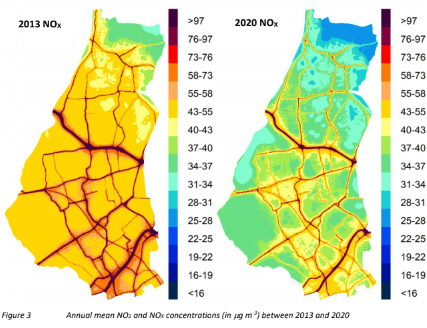 One of the many figures in the report showing the expected improvements in air quality resulting from the Mini Holland schemesA new study by Kings College* vindicates the Waltham Forest Mini-Holland scheme, notably the Low Traffic Neighbourhoods. The study shows that residents of Waltham Forest will gain an average of one month of life from the Mini-Holland and related works in the borough. That leaves a reduced life expectancy of 6 to 10 months from the remaining air pollution which needs to be addressed by more local works, extending the Ultra-Low Emissions Zone (ULEZ) to the whole of London, phasing out of diesel and a general reduction in road traffic. In short, it needs a Green transport policy at local, London and national level. * Air Quality: concentrations, exposure and attitudes in Waltham Forest. Kings College, 2018. Written on 31 July 2018 . This year August 1st is Earth Overshoot Day, the date when we (all of humanity) have used more from the rest of nature than our planet can renew in the entire year. This date moves about three days earlier each year as our consumption, population and emissions increase. We are currently living as if we had 1.7 Earths, a 70% overshoot. The dangerous realities of the situation were summed up in “World Scientists’ Warning to Humanity: A Second Notice". In November 2017, over 15,000 scientists in 184 countries signed up to support this and over 5,000 more have signed since then. The sign-up to this warning has now been opened to the wider public and to organisations. We in Enfield Green Party have signed this and we urge every person and every organisation that values our future to do so too. You can sign at www.scientistswarning.org/please-sign. This is not a party-political issue. We are happy to work with others to promote public policies and private actions that will help us escape this escalating crisis. To be blunt, it will put problems caused by Brexit, hard or soft, in the shade. Recent forest fires are just the most recent wake-up call for the dangers we face. In the face of this peril we need our best thinking and our most resolute leaders. Nothing less will do. For more information and comment please contact Alex McRae, co-chair, Enfield Green Party, on and +44 7891 608938. Enfield Green Party candidates standing in next month's council elections have appeared in the first two of a series of online hustings. Francis Sealey of Enfield Voices and Emma Griffin of Love Your Doorstep are the moderators passing on questions from members of the public to candidates representing the Green Party, Labour, the Conservatives and the Liberal Democrats. Enfield Green Party has signed up to My Liveable London - the campaign for healthier, safer and people-friendly streets that was launched this month by London Living Streets and the London Cycling Campaign. I am writing to you to confirm that Enfield Green Party and its 24 candidates in 20 of the wards in our council elections pledge to campaign for our new council to submit a high-quality Liveable Neighbourhood bid. Indeed the creation of Low-traffic Neighbourhoods is the lead item in our Ward and Borough Newsletters (See attached copies). As well as signing up to this London-wide campaign, Enfield Greens have also committed themselves fully to the Enfield-specific pledges requested by Better Streets for Enfield. Written on 08 April 2018 . The Campaign Against Climate Change has organised a second protest outside the International Maritime Organisation meeting, on Tuesday morning (10th April). Read their message below. The carbon footprint of international shipping is an issue that goes under most climate campaigners' radars, but right now it's the biggest show in town. The International Maritime Organization, the UN body which regulates shipping, is holding talks in London to decide on their strategy to cut emissions. While some nations are pushing for a plan in line with the Paris climate agreement, other options on the table are nowhere near the ambition needed. (Calling Londoners) We're looking for as many people as possible to join a protest outside the talks on Tuesday morning - information on our website and on Facebook Please join and invite friends! If you'd like to read more about what's at stake in the talks (if shipping were a country it would be the sixth biggest polluter), and the mutky world where 75% of ships are registered under flags of convenience, where journalists can be banned from the IMO from reporting who said what, here's a beginner's guide. If you'd like to see pictures and the campaign video from the earlier protest which took place on the first morning check here. Campaign against Climate Change came along as supporters with placards, while 'ship stewards' gave delegates boarding cards for the Good Ship Paris... and urged them not to sink it! A representative from the Marshall Islands thanked us all for being there and said it was the first time he'd seen protesters outside IMO negotiations. To fight for climate action we rely on support from our members - please sign up here to give a small monthly amount or one-off donation. Find out more at www.campaigncc.org. Written on 04 April 2018 . Members of Enfield and Haringey Green Parties joined the IMO protest yesterday. This week and next delegates to the International Maritime Organisation are meeting in London to set new policies on Climate Change. The current policies are terribly weak and may even imply increased emissions. The protesters demanded that the IMO commit to the Paris Agreement - and eliminate sea transport emissions by 2050.